International efforts to reduce illegal drug use are succeeding in containing the global threat posed by drug use and drug trafficking. These efforts have evolved over the past century to include a balance of supply reduction and demand reduction. The future of drug policy builds on this foundation, using new ideas to make tomorrow's drug use prevention strategies even better than today’s. IBH is a proud member of the World Federation Against Drugs, a multilateral community of non-governmental organizations and individuals working toward a drug-free world. IBH President Robert L. DuPont, MD serves as the North American representative on the WFAD Board of Directors. 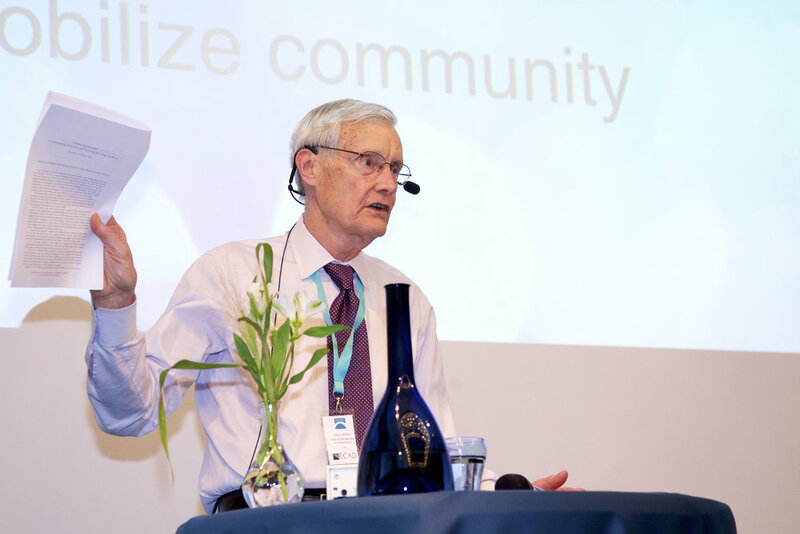 In May 2018 Dr. DuPont participated in the 6th Annual World Forum Against Drugs in Gothenburg, Sweden and presented closing plenary remarks. Drug supply and drug use are global problems. The effect of drug use knows no geographic, cultural or economic boundaries and neither does the devastation it causes. In response, a balanced drug strategy of demand reduction and supply reduction has been adopted by the international community with leadership from the United Nations. The goal of this balanced strategy is abstinence from illegal drug use. Only abstinence will curtail the social and economic costs associated with drug use. Illegal drug use causes negative outcomes such as accidents, school failures, developmental problems, mental illness and crime. Many crimes result from the intoxication produced by illegal drug use. There are some who argue that the balanced strategy is not working and that abstinence is a hopeless goal. These critics want to contain or eliminate the role of law enforcement. In the name of compassion and realism they call for the international community to help illegal drug users by ensuring safer injection sites, purer drugs, and easier drug availability. This point of view is known as Harm Reduction because it seeks to reduce some of the harms from drug use without reducing illegal drug use itself. However, Harm Reduction increases social acceptance of illegal drug use and encourages drug use by making illegal drug use easier, cheaper, and safer. It is the unwitting road back to an earlier era of more open drug markets that created massive worldwide drug problems. Why has drug use become a growing global problem in recent decades? Drugs of abuse produce a powerful brain reward that promotes repeated use of these substances despite the harm they cause to individuals, families, communities and nations. The widespread availability of illegal drugs by potent routes of administration by large populations, especially young people, is a direct result of globalization's fast, easy supply routes accompanied by rapid changes in the social, economic, cultural and religious structures that previously monitored and contained unacceptable behavior. Sweden, a country with a history of being a compassionate welfare state, has adopted a powerful and thoroughly modern vision of a drug-free society. During an intravenous amphetamine epidemic that rapidly swept the country in the 1960s, Sweden initially authorized the distribution through medical channels, of amphetamines and opiates. The objective of this policy was to reduce the crime associated with drug use, as well as hopefully to wean addicts from their severe drug habits. However, amphetamine and opiate use increased directly as a direct result of this program. The Swedish government then reversed itself and adopted restrictive drug policies and the intravenous drug abuse epidemic abated. IBH encourages collaboration between nations to promote a balanced global drug strategy that encompasses law enforcement, prevention and treatment to contain both the supply of illegal drugs and the demand for them. In November 2016 IBH President Robert L. DuPont, MD participated in the first narcotics workshop hosted by the Pontifical Academy of Sciences (PAS) at the Vatican entitled, "Narcotics: Problems and Solutions of this Global Issue." In February 2017 PAS released a Final Statement making clear recommendations for actions by the international community. More IBH Events.